I’m finally allowed to say it. I’m playing Albus Severus Potter on Broadway starting March 20th. Since the age of six, my mother would read me to sleep with those stories. My sister wrote me a fake Hogwarts acceptance letter. Even last year, during a freak subway accident in New York, I calmed down and got myself through it simply by reminding myself that I am a Gryffindor. Harry Potter has had a profound impact on my life, and it is an honor and a dream to be carrying on that legacy and love to theatre goers, old and new, as the story continues. I mean, I like to consider that my mom, who’s English herself, reading to me night after night with all the different accents, inspired me to become a storyteller myself. So who knows what kids will come to see this story and be inspired to love harder, listen closer, and feel deeper. The world has always needed stories like this, filled with empathy and magic. Especially today, it’s pretty obvious that in our world of constant communication, we all need a bit more time for connection and hope. I think that’s what this play offers, amongst a whole lot of other things, including some really really cool magic. But at the end of the day, it just feels really cool to call myself a Potter, I mean, come on, that’s pretty cool. I was so lucky to have this as my first feature film. The role was as rewarding as it was challenging, the cast was as hard working as they were loving, and the music… well the music just rocked. By the end of it, I am a proud co-songwriter of three of the original songs appearing in the film, and was given a free masterclass in recording and performing by the original Summertime Dropouts. Oh, yea, that’s right! They were a real band! And a terrific one at that! The six leads of the film, Crystal Lake Evans, Caleb Donahoe, Melanie Brook, Takaya Abdou-Lloyd, Serena Williams, and myself, are not yet ready to say goodbye to one another, so whether it be a sequel, or a new pop-up band in New York, stay tuned to hear some of our punk rock awesomeness! Back in November, I was approached by a composer at Juilliard, Jack Frerer. We knew each other a bit, I mean, we had been in the same liberal arts class the year before. He approached me with a story board and a nine minute chamber piece he had written. The piece was called "Downloads," and it was apparently a hyperbole of the emotional journey we take while downloading different types of files. By the way, he was going to turn it into a film. By the way, he wanted me to help him make it. Of course, when a genius composer asks you to be in his film, you don't think, you say yes. And nine months later, here we are, the film is finished. I'm very proud to have been a part of this project. We're off! Visiting family, enjoying the beautiful weather, making music, and meeting with all sorts of folks who make movies and theatre and art, I'm having a pretty damn good time after closing Turning Off The Morning News. It's now onto the next few projects, which include wrapping up an episode on The Roof, and beginning to compose the score for a new short film. But that's all happening when I get back to New York on June 18th. For now, we all have to just take in the sun for a moment. It's been an incredibly formative four years, and now it's time to go. Well, actually I had to go pretty much as soon as the ceremony was done to make it to my show that night. I know I'll always have the teachers there who inspired me as part of my extended family. And I know I'll stay in touch with my group mates, who I've spent more time with than any family member I've ever known. So basically, all I've given up is my school I.D. and mail key. Not a bad trade for a degree and life changing lessons. During the ceremony, I was surprised with being awarded the Michel & Suria Saint-Denis Prize in Drama. And my classmates Manon Gage, Brittany Bradford, Allen Tedder, and Toney Goins were also honored with various awards. And when the entire group walked across the stage to receive their degrees, I was practically bursting with pride. Yesterday, during our final dress rehearsal, the McCarter asked me to "take over" their Instagram account. I leaped at the chance. Here is the first video of four! The Premiere of Chris Durang's New Play at the McCarter Theatre! Ah! Ah! I have news. I have been cast and already am in rehearsals for the premiere of Chris Durang's new play Turning Off the Morning News at the McCarter Theatre. I'm working across from Kristine Nielsen, Robert Sella, John Pankow, Rachel Nicks, and Jenn Harris, being directed by Emily Mann, and get to talk over the character and choices with Chris himself. It's so incredibly humbling to be in this room after being at school for the past 4 years. I feel as though I'm in a constant masterclass on how to rehearse. We don't spend endless amounts of time talking about how we'll take a note, we simply take the note and begin doing. There is so much talent, inspiration, and love in the room already, and I'm so thrilled to be a part of the cast. In preparation of my Juilliard showcase (which is Monday in NY!! ), the school has put up short videos of every member in the class talking about something that is personal to them. I would very highly recommend for you to go check out ALL of the videos. I love these classmates very much, and I hope these videos give you a glimpse as to why. To get you started, here is my video and my story about being in a subway accident over the summer. I look forward to seeing you all at showcase! NY is April 2nd, LA is April 18th! Now, this was cool. Two days prior to this event, I got a call from my old friend from this summer's production of Big River, Javier Colon, asking me if I wanted to sing a few songs with him at his upcoming gig in New York. It was on a Sunday, my only day off, so of course I said yes. I had no idea that the gig was at 54 Below, which is an awesome venue that I've watched videos of with people like Josh Gad and Neil Patrick Harris perform. It was such a pleasure to work with Javier again and see some old friends from the cast. And I forgot how incredible his voice is... but then, there's a reason to why he won "The Voice." I really do miss this cast. Farewell, Harlequin. I must say, if it hadn't been for the opportunity given to me by the awesome Stephen Wadsworth, I might have never known how much I love commedia dell'arte. I was on my toes the whole time, and always having to keep my engine running at 100% whenever I was out on stage. It was an absolute joy, and I was delighted to hear that the audience felt the same way! People who attended have consistently been more likely to talk about the solidity and greatness ensemble as a whole than any one particular person, and I consider that to be the highest of compliments. We put together a complete story, not separate chances for individuals to show off. And now, I will be ready and excited to play Harlequin from now till the day my body can't climb a 10 foot carriage. 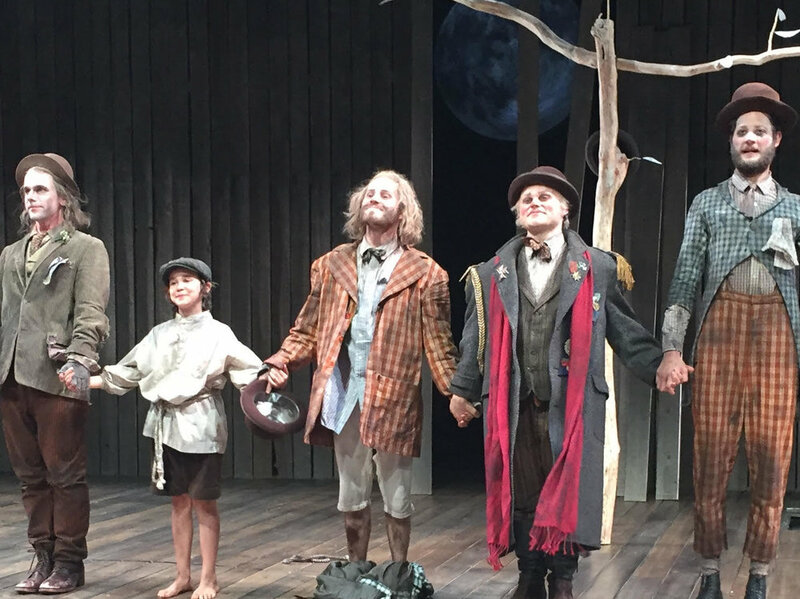 But seeing as it's over, we're diving immediately into the next show at Juilliard; Waiting For Godot. Weirdly, this has been one of my favorite show since I was 7. That's right, my parents took a 7 year old to an existential Samuel Beckett play. But hey, turns out I liked it! A lot! And here I am, about 40 years ahead of schedule, playing Estragon at the end of my fourth year. With Moni Yakim directing, who has been at the school for 50 years since Group 1, I couldn't have dreamed a better way to end my career as a student. It will be running from February 11th-17th. You can get tickets by CLICKING HERE. We have our first reading this next Monday, so wish me luck! My first fourth year production at Juilliard is a week away from opening! I'll be playing Harlequin, a commedia dell'arte clown, in the 18th century French comedy, Triumph of Love. Yes, I was dubious as well when I first heard that my fourth year production would be set in the 18th century. But under the incredible direction of Steven Wadsworth, who's the same guy who translated and adapted the script, it's definitely going to be a show not to miss. And my bruised limbs and aching body beg to agree that the whole cast and I are giving it everything we've got. It is a ridiculously physical show. I climb carriages, leap from columns, and practically never stop moving! So IS My Album Done Yet? After a week filled with collaborating with some incredible artists like Toney Goins, Nya Muchai-Kinya, Elisabeth Evans, and Mike Nappi, I'm proud to say my album is close to completion! I'm now sending it out to producers and music supervisors for film and TV, so listen for my music this next year! You could also just listen to snippets of the album under the music tab on this website, but where's the anticipation in that? Nowhere. There is no anticipation in that. For only 4 performances, I'll be performing as Huck Finn in Big River with Javier Colon (winner of The Voice Season 1) as Jim in Fairfield Connecticut! We're being directed by Kirby Ward, a great New York based actor and director, in whose capable hands, I think, we can make this 1850 story into a politically relevant discussion about the historical roots of racism, the moral compass of humanity battling against the standards of society, and the increasingly important question of right and wrong. The run is from June 15th-17th, so don't miss it! My Drama Group 47 at The Juilliard School has put together a collection of political speeches that will be presented on campus at 6:00pm in Paul Hall on December 13th, 2016. I will also be releasing videos of the speeches as a series here and on Youtube, so look for it! I've been writing music since I was seven and tap dancing since I was eight, and figured the two might just go together. So, in my first music video to my new single "We'll Try It Again," I thought it was as good of a time as any to combine the two! After some blood, sweat, and sunburn, the music video is nearly finished. But in the meantime, you can watch the trailer!